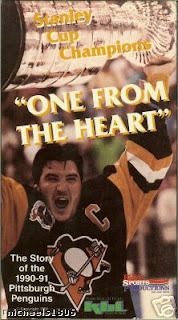 I was there when Phil Bourque screamed that line! The place went nuts! Yeah, we'll see about Portrait of Courage. There is definitely some great stuff there, but it is really painful. I might just have to do it as a type of excorcism to get ready for the new season. They need to do a special commerative DVD of all these movies, complete with commentary from players. Who wouldn't pay $20 for a chance to hear at least Bourque and Errey (you know those two would do it) giving their anecdotes on the games and season. I think this line may even trump all the lines from Against the Odds. While AtO was all-around more powerful, ridiculous, and awe-inspiring, "THE DANCE OF CHAMPIONS" beats all the other lines from AtO individually. Great job on both videos. My buddies an I still yell out that Phil Bourque line when we're all drunk. The Dance of Champions is definitely the cheesiest of the two videos, and in my opinion, cheesiest of all time, so its without a doubt #1. Yet, listening to Earl Mann say Ulf is a like a sweedish linebacker...It confuses me more and more everytime I watch that old VHS.